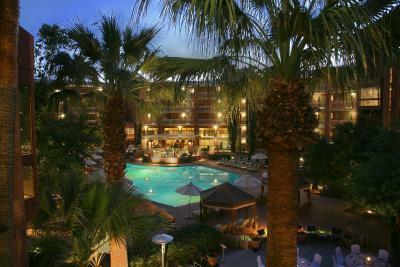 Lock in a great price for Radisson Suites Tucson – rated 8 by recent guests! The pool and jacuzzi was great. The restaurant Breeze has great burgers and pizza. Ran out of Salmon ...? No real ambiance. Family friendly and close to U of A. EVERYTHING!! This is a beautiful place to stay! Quiet, with professional friendly staff!! The rooms are clean and comfy! The room was spacious. Comfortable! Having a separate room for beds but still having a Tv was great. Didn’t have to share one Tv. The living room was a good size to be comfortable. Bathroom was great size, could use a little upgrade but overall great! This property would be great for a family or couple. Everything but the bed it was extremely uncomfortable. Very good selection and very well done! Good coffee and eggs done well! the grounds were beautiful and well maintained. I think the staff were pleasant, and the sleep number bet was a definite plus to the room! Front desk staff was friendly. Grounds were nice. Pool and hot tub open until 11 were a bonus. Radisson Suites Tucson This rating is a reflection of how the property compares to the industry standard when it comes to price, facilities and services available. It's based on a self-evaluation by the property. Use this rating to help choose your stay! The University of Arizona and downtown Tucson are 6 miles west of this all-suite hotel. It features an outdoor pool surrounded by a tropical courtyard, on-site dining and suites with 2 flat-screen TVs. A private bedroom and separate living room are offered in every warmly decorated Tucson Radisson suite. Coffee facilities, a microwave and fridge are provided. Free Wi-Fi and in-room movies are also included. Breeze Patio Bar & Grill is open all day and has an open-air patio. It serves American cuisine made with fresh regional ingredients. A full drink menu is available at Breeze Lounge. Radisson Suites Tucson provides a free shuttle service within a 3 miles radius. Guests can use the gym and the business center for free. 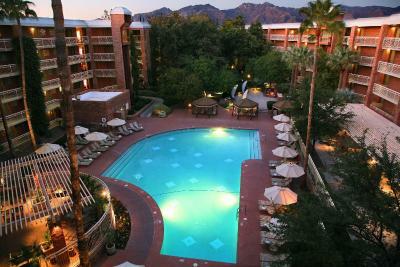 Tucson International Airport is a 30-minute drive from this hotel. 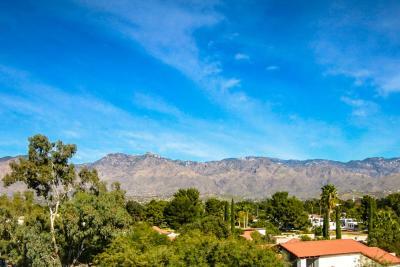 Sabino Canyon tours are 7.2 miles away and Reid Park Zoo is 15 minutes away by car. When would you like to stay at Radisson Suites Tucson? This suite features a microwave, cable TV and seating area. The hotel features spacious suites and includes complimentary high speed wireless internet, mini-fridge and microwave, executive desk, living area with pull out sleeper sofa, and extra-large bathrooms with a separate bath tub and shower. Our Tucson lodging is a welcome luxury for any traveler. Private balconies (not on 1st floor) offer a glimpse of the famed mountain scenery of the Southwest. The resort atmosphere is complimented by out array of upscale amenities, including: -Oversized temperature-controlled pool, with hydro spa -The Breeze Patio Bar & Grill offering a mix of Southwestern, Pacific Rim, and American cuisine -Business Center -Executive fitness room featuring Life Fitness equipment - Complimentary Shuttle within a 3-mile radius -Game room -14,000 sq ft of flexible meeting space -outdoor garden settings -Coin-operated laundry facilities on property. House Rules Radisson Suites Tucson takes special requests – add in the next step! Radisson Suites Tucson accepts these cards and reserves the right to temporarily hold an amount prior to arrival. The house keeping services were poor. The first day, our son’s sofa bed was left unmade and the bedside tables were not cleaned. Rooms need a little bit of a update. The upholstered furniture was shabby and needed cleaning. Convenient to hiking. Sleep number bed. Beautiful green spaces to relax with a book. Problem with shower looked into immediately. The pillows were flat, and very uncomfortable. front desk staff, dated atmosphere. Don’t have anything to complain about really. It really needs to updated. The rooms were faded and dated and except for the pool area the hotel seemed old! Didn't get to eat the waffle, didn't work out! the rooms are dated. Our heater made a horrible noise, but to the credit of the hotel, someone came in and fixed it the next day. The TV, carpeting and furniture were clearly dated. We did not ask for cleanup the first 2 nights, but on the 3rd day, someone made the bed but left dirty coffee cups and did not leave replacement coffee, etc. It was a quick cleanup job and it was a little surprising.